To create Figure 4-18, I converted the image in Color Plate 4-2 to the Lab mode. 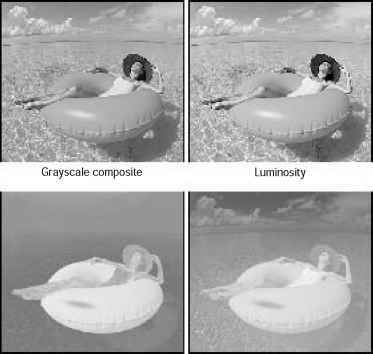 The image in the luminosity channel looks very similar to the grayscale composite because it contains the lightness and darkness values for the image. The a channel maps the greens and magentas, while the b channel maps the yellows and blues, so both channels are working hard to provide color information for this photograph. Certainly there are differences — the a channel is hotter in the raft, while the b channel offers more cloud detail — but the two channels carry roughly equivalent amounts of color information. Figure 4-18: The grayscale composite followed by the contents of the luminosity channel and the a and b color channels after converting the image shown in Color Plate 4-2 to the Lab mode. 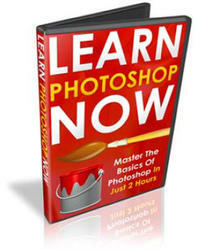 You can achieve some entertaining effects by applying commands from the Image ^ Adjust submenu to the a and b color channels. For example, if I go to the a channel in Figure 4-18 and reverse the brightness values by choosing Image ^ Adjust ^ Invert (Ctrl+I), the water turns a sort of salmon red and the raft turns green, as demonstrated in the first example of Color Plate 4-3. If I apply Image ^ Adjust ^ Auto Levels (Ctrl+Shift+L) to the b channel, the sky lights up with brilliant blue without altering so much as a color in the woman or her raft, as in the second example. The third example in Color Plate 4-3 shows what happens when I apply both Invert and Auto Levels to both the a and b channels. Now there's the way I want to vacation — on a different planet!